In this post, we help give entrepreneurs an idea of how to calculate office space by using the Keyser iPhone app to reverse engineer the new Airbnb Headquarters the SoMa neighborhood of San Francisco. On any given night, around 140,000 people are staying in Airbnb properties, which span 34,000 cities in 192 countries. Using information we gathered from a variety of articles about the new Airbnb office design, this post roughly breaks down their estimated square footage needs as it relates to their office space. 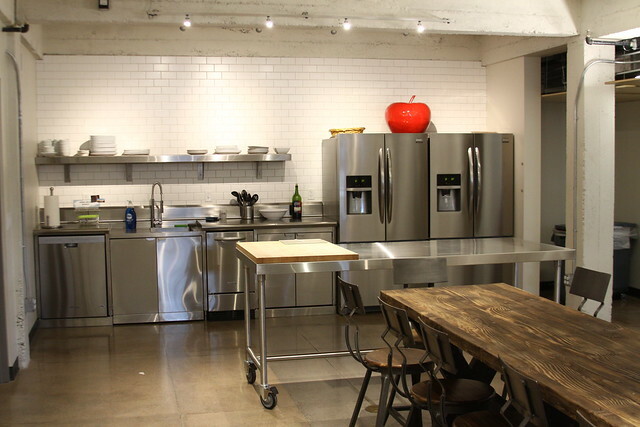 First, here’s a few pieces of information about Airbnb that will help us estimate their office space needs. 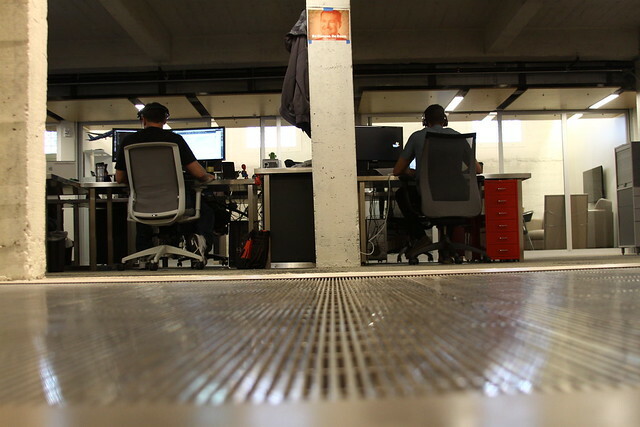 – 637 employees across several departments ranging from information technology to creatives (San Francisco only). In this article written by co-founder & CEO Brian Chesky, you get a pretty clear sense that culture is everything for Airbnb. – The stronger the culture, the less corporate process a company needs. – When the culture is strong, people can be independent and autonomous. – Culture is the foundation of Airbnb. : Let’s assume the Airbnb co-founders have the only C-Suite offices, and that the estimated 25 other Airbnb VP’s and C-Level executives enjoy Executive Sized offices. : Engineers are pretty important to AirBnb’s success, so let’s assume each engineer lavishes in the comfort of a large office space that can be also used as a shared meeting space. : Airbnb has some very cool information technology and it’s competing against Silicon Valley to attract the right talent. Let’s assume Airbnb offers IT people the enjoyment of the equivalent of a small office space (100 square feet). With 121 IT employees, we’ll allocate 121 “small offices” or 12,100 square feet of office space to information technology. : Let’s assume that each business development and finance employee needs a little privacy and quiet to do their job effectively. 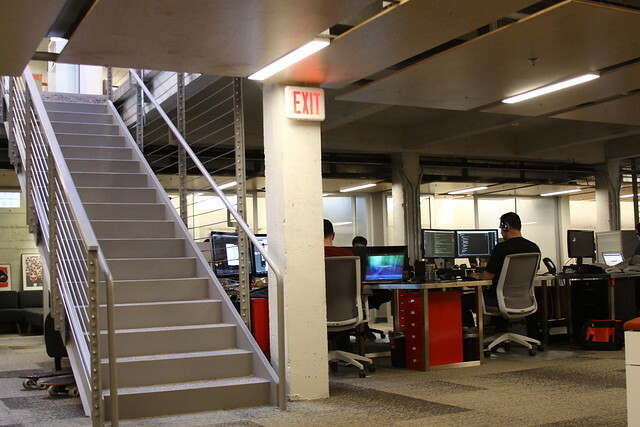 We’ll allocate a standard sized office space for the 20 biz devs and 18 finance employees. : Since Airbnb is undeniably unique with a distinct look to it’s product experience and marketing, let’s assume the Creative team (45 employees total) have their own medium sized offices. Let’s also assume the product employees have slightly smaller medium sized office spaces (36 total). That’s about it for our office space assumptions. Let’s move on to our workstation assumptions based on the Airbnb employee breakdown. With our office space assumptions, we made rough square footage estimates based on the Airbnb engineering, creatives, information technology, executive level, finance and product teams. This leaves us with the admins, human resources, and “other” departments to calculate office space requirements. 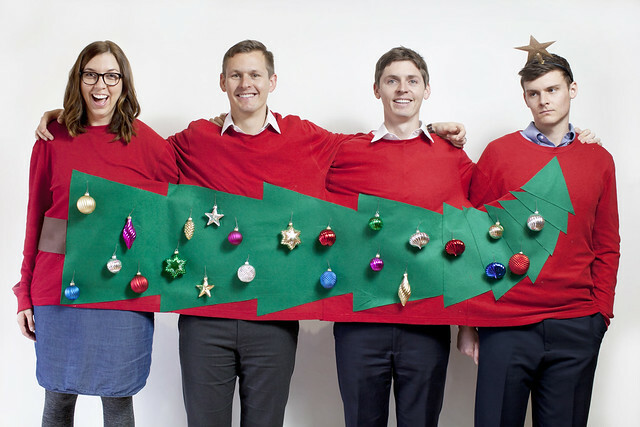 : All “other” 242 employees will on average occupy large cube. 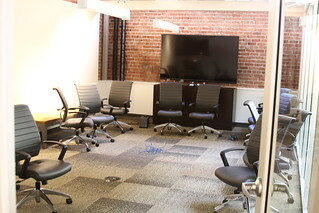 Let’s assume Airbnb has multiple conference rooms based on their employee size. Let’s assume that three of the conference rooms are “large” (Seats 16-20 people) and one of them is “medium” (seats 8-10 people). Let’s also assume that the majority of meetings take place in living rooms instead of conference rooms – just like you would experience at home. Let’s also assume that the training room that exists at Airbnb is the extremely large town square / plaza type of space in the center of the building. 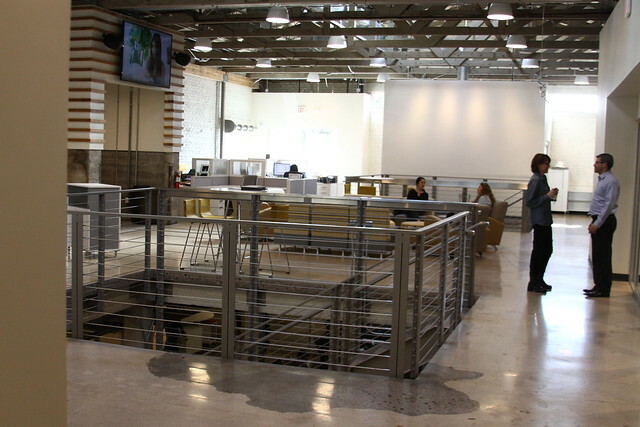 This space is large enough to seat the entire company for an all hands on deck type of meeting. For smaller training sessions, let’s assume there are four small training rooms that seat up to sixteen people at a time. The Airbnb welcome mat that greets visitors appears to be quite large. In looking at the diagrams within the Keyser app and comparing them to the Airbnb pictures, we’ll allocate two large and two small reception areas for visitors. Let’s assume one large and one small copy room space for every 100 employees would equate to about 6 large and small copy rooms throughout the Airbnb headquarters. Let’s also make general assumptions that the Airbnb building has a few small storage closets that are filled floor to ceiling with Obama O’s and Cap’n McCain’s. Just like the listings on their website, Airbnb has some unique areas. 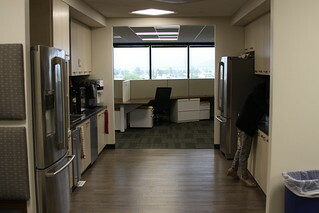 A large kitchen area with a walk up bar and multiple large break room sized areas exists for employees to grab a bite to eat. We’ll assume that Airbnb’s bar is about twenty times the size of an average coffee bar space. Several wellness areas provide a relaxing escape. A library room for focus work with several rooms designed for workers to keep their workplace environment fresh. Let’s allocate two large server rooms for the needs of Airbnb employees. Bottom line: the new office for Airbnb is more than an office – it’s a home for the employees and culture of Airbnb. Based on our office space assumptions and estimates, let’s submit and calculate the Airbnb office space needs in terms of square footage. The Keyser iPhone app will automatically calculate hallways circulation square footage, as well as load factor, usable space and the total amount of rentable square feet. This calculation is especially useful to help narrow down your office space search. Without further ado, here is our reversed engineered calculation of the Airbnb headquarters in San Francisco: 169,538 Square Feet. To help champion the concept of selfless service, Keyser is shining the spotlight on organizations who are committed to serving others. Today, we’d like to feature Special Olympics Arizona and how they are practicing selfless service through the work that they do. For people with intellectual disabilities, Special Olympics is often the only place where they have an opportunity to participate in their communities and develop belief in themselves. For athletes, Special Olympics sports provide a gateway to empowerment, competence, acceptance and joy. Here’s our interview with Chas Harvick, Board Officer and Treasurer of Special Olympics Arizona, on how their organization practices selfless service. Special Olympics Arizona currently serves approximately 17,000 athletes with over 200 competitions throughout the year and has developed leading programs that provides inclusion for athletes at schools through Project Unify and health services for athletes through Healthy Athletes. In addition to the tremendous service Special Olympics’ provides for the athletes the staff, volunteers and supporters of Special Olympics receive so much more in return. A fun fact that many people are surprised to know is, more than half of adult Special Olympic athletes in the United States are employed, versus 10 percent of intellectually disabled persons who do not participate in Special Olympics. In January 2011, I was asked to join the Fundraising and Development Committee of Special Olympics Arizona. I was aware of the organization but, didn’t fully appreciate the power of Special Olympics Arizona until researching the opportunity. My involvement with the organization has since snowballed to include being a member of the Special Olympics Advocacy Resource Council, accepting an invitation to be on the Board, and this year becoming a Board Officer as Treasurer. Also in the past few months, I led the charge to develop an Emerging Leaders Council for Special Olympics Arizona. The Emerging Leaders Council are young professional community leaders throughout the Phoenix Metropolitan Area that formed a council to provide support, resources and connections to spread the mission and grow the programs of Special Olympics. We had our first Emerging Leaders Council meeting this week and I couldn’t be more excited about the talent and energy of the members of the Council – they are going to do great things for the organization and our community. I appreciate the opportunity to share a bit of my story with the Keyser team however, I struggled with the notion of selfless service as no matter how much I give to Special Olympics I feel I get so much more in return. Once you get involved with Special Olympics Arizona the excitement, growth and day in and day out success stories make you want to do more to be part of the movement – it’s an awesome journey. To learn more about the organization and all the wonderful ways you can be part of the movement, visit their website at http://www.specialolympicsarizona.org/. Please include attribution to http://keyserco.com with this graphic. Keyser, an innovative commercial real estate advisory firm providing global real estate services to tenants of office, industrial, retail, healthcare, technology and educational space, announced that Jeffrey Houser, Cameron Quick and Ken Peterson have joined the growing firm. Meet the newest Keyser members below. Jeffrey Houser brings to Keyser a unique professional background including education management, not-for-profit management, financial advising, both within the US and abroad, general contracting and years as an Arizona real estate broker. Jeffrey is a dynamic and energetic individual who knows what it means to serve selflessly. He has a rock solid work ethic and a commitment to getting results. Prior to joining Keyser, Jeffrey was the Vice President of Financial and Corporate Services at BASIS.ed, the nation’s premier education management company. It was there that Jeffrey had the opportunity to help start and lead two charter schools, BASIS Peoria and BASIS Phoenix. Later as Director of Finance, Jeffrey assisted in the company’s expansion initiatives, before moving into the role of VP. I was raised to believe that we get more by giving. I’ve even read that giving improves one’s health. Ralph Waldo Emerson once said, “It is one of the most beautiful compensations of this life that no man can sincerely try to help another without helping himself.” Giving simply means selfless service. That is to do for someone else what you know in your heart is right. Many of us could do this consistently if it wasn’t for fear; fear of losing wealth, fear of losing control, fear of looking stupid. However, the radical truth is that we weren’t created to be served but to serve. I am deeply committed to my beautiful wife of 25 years and strive to support our two children in ways that will make them independent thinkers. I’m convinced that true success includes achieving a thriving and harmonious home and no achievement at work can eclipse this reality. For years I’ve been convinced that selfless service was the only worthy business model. Not until meeting Jonathan Keyser did I see such a bold embrace of this model, and I knew I needed to become part of it. 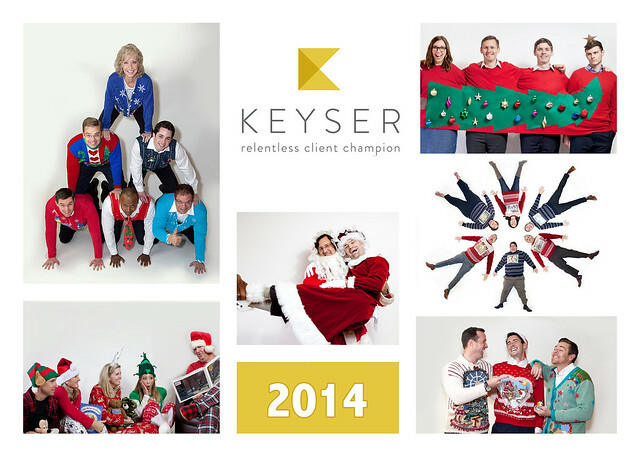 Relentless client champion is not just a tagline or a phrase that is uttered, at Keyser it is lived. 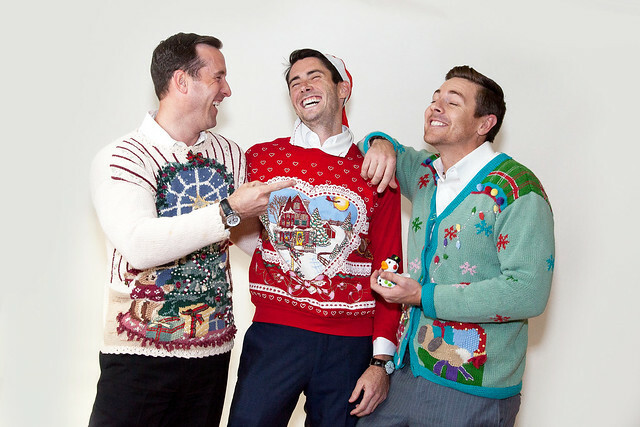 Ken will be working as a partner to Jeffrey Houser and Andy Mcmillan in the Education and Not-For-Profit Division. A recent graduate of ASU, Ken brings a diverse background that includes finance, business law and real estate. Ken’s strengths lie in his unique ability to provide research, analysis, and transaction management resulting in best-case scenarios for clients. Service has always been an instrumental part of me life. Growing up my family taught me the importance of serving others. I learned that in giving, you will receive. I do my best to put the needs of others before my own and through this humble strategy I have learned how fulfilling a life dedicated to service can be. I continually look for opportunities to selflessly serve others in all aspects of my life. The first time I came across Keyser and the 15 core principles I was immediately intrigued. It was refreshing to see a company that was thoroughly committed to selflessly serving others. Coming into Keyser, I saw that these principles were not just words but are truly a part of the culture. Each member of Keyser is held accountable to live by these principles and be the best that they can be. For this reason, Keyser is the company I want to be part of. Cameron’s passion to have a global impact on education was kindled in 2005, while teaching in orphanages in Tanzania. Since then, he received his Master’s Degree in Curriculum and Instruction, and taught for five years in the Phoenix Elementary School District. While teaching, Cameron was very involved in the district leadership team and mentored new and upcoming teachers. Prior to teaching, he earned his B.A. in Communication from ASU, and owned and operated his own business. Cameron has spent the last four years working for the Arizona Charter Schools Association, serving charter schools across the state with all their business needs. He created a statewide group purchasing organization, allowing charter schools across the state to access reduced costs on commonly purchased items. Cameron launched the Arizona CharterMarketPlace, allowing charter schools to search, find, and review all businesses working to support schools with products or services. Additionally, he created a position to proactively support all business leaders across the state, with any and all business and operations needs. Service is and has always been engrained in my family for generations. Growing up, I was always taught to love others, and the best way to show love, is through service. At the Arizona Charter Schools Association, my role is that of service. Helping any and all schools, tackle challenges of all sizes, directly supporting the business and operations, while indirectly impacting students, is how I serve best. Through giving, I am able to directly help and support schools and non-profits in ways they might not have considered historically. It is this service that brings joy to my heart. After working with many commercial brokers and hearing all the issues that came about, Keyser was a breath of fresh air. They were the first group to identify unique solutions to the challenging facility issues our schools face on a daily basis. They out worked, and outperformed everyone else in the arena, and our schools in turn, were left with a campus their students could call home. All of the support services surrounding facilities for our charters, are one-of-a-kind. There is no other brokerage company out there offering this turnkey solution for our schools. Keyser is a best-in-class commercial real estate advisory firm that exclusively represents tenants and corporate space users. Services include Transaction Management, Project Management, Site Selection, Space Efficiency Planning, Capital Markets / Corporate Finance, Lease Portfolio Services, Strategic Advisory Services, Incentives Negotiation, and Subleases/Dispositions. We have 15 core operating principles that every member of Keyser is committed to living by. We are consumed by the pursuit of personal and professional alignment to each of these principles; for we know that by doing so, we create extraordinary success for our clients and partners, and within our own lives. This month’s featured operating principle fits in well with the release of our newly launched, first-of-its-kind commercial real estate iOS app: the Keyser Office Space Calculator. Learn more about the app at GlobeSt and download the app here. We are disruptive, we embrace change, and we are forward thinking in all that we do. We continuously explore and integrate new tools and innovations, with the goal of maximizing personal efficiency and providing best-in-class service to each and every client. How are you practicing disruptive and embracing change? Leave a comment below! In this post, we help give entrepreneurs an idea of how to calculate office space by using the Keyser iPhone app to reverse engineer the Square Headquarters in San Francisco. Using information we gathered from a variety of articles about the Square headquarters, this post roughly breaks down their estimated square footage needs as it relates to their office space. First, here’s a few pieces of information about Square that will help us estimate their office space needs. – 889 employees across several departments ranging from information technology to product development (San Francisco only). – 889 employees (employees have mentioned on Quora that there were 250 employees in March 2012 and 600 employees in November 2013. Since the company is rapidly growing and there isn’t a recent employee count, we’ve taken Square’s Linkedin’s employee estimates from just the San Francisco area. We’ve also created an “other” category for employees that are uncategorized). 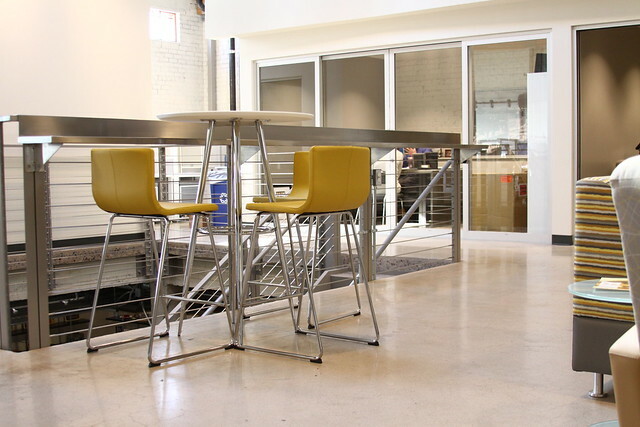 In this Fast Company article, Chris Gorman, Square’s head of office experience made sure the space would allow actual employee interactions to occur. 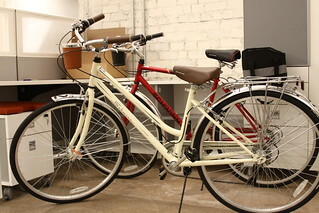 – Want the same variety of a city in the office – where employees walk, congregate, get coffee, relax and get stuff done. : Let’s assume co-founder + CEO Jack Dorsey has a large C-Suite office, and that the estimated 25 other VP or C-Level Square executives enjoy Executive Sized offices. 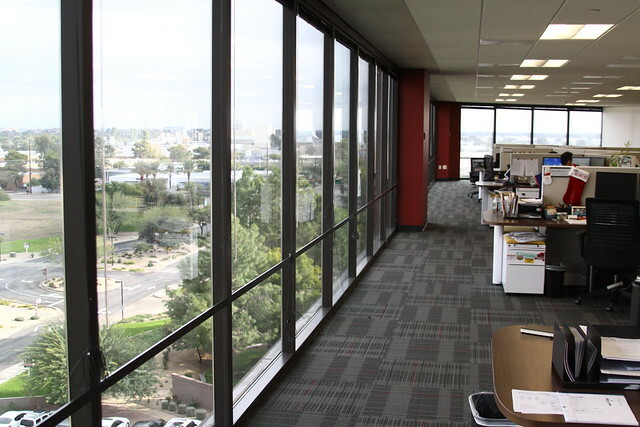 : The engineers and product teams work collaboratively, so let’s assume 4 employees for every Large office space. 84 engineers and 53 product development employees with 4 team members per space would equal 34 large offices. : Square is built on it’s information technology and it’s competing against Google, Facebook and Silicon Valley to attract the right talent. 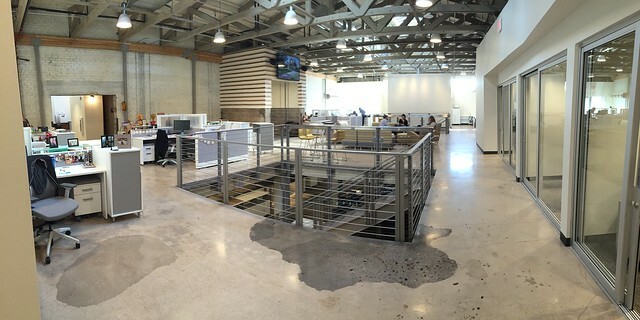 Let’s assume Square offers IT people the enjoyment of the equivalent of a small office space (100 square feet). With 175 IT employees, we’ll allocate 175 “small offices” or 17,500 square feet of office space to information technology. : Let’s assume that each business development and operations employee needs a little privacy and quiet to do their job effectively. We’ll allocate standard office space for the 25 employees in operations and the 33 biz dev employees. : Since Square has a beautiful, clean look to it’s product and marketing, let’s assume the Creative team (33 employees total) have their own medium sized offices. That’s about it for our office space assumptions. Let’s move on to our workstation assumptions based on the Square employee breakdown. 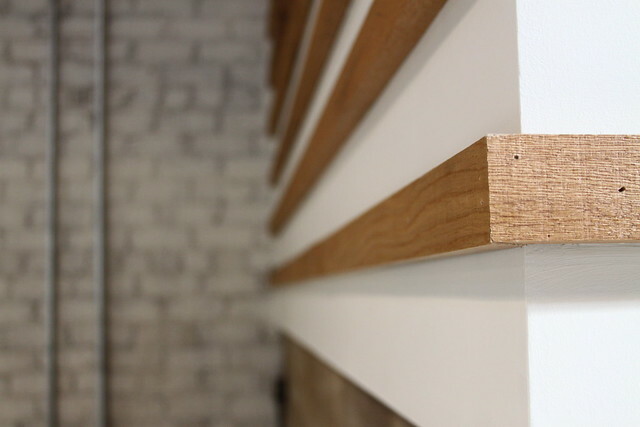 With our office space assumptions, we made rough square footage estimates based on the Square engineering, product, information technology, executive level, creative, operations and biz dev teams. 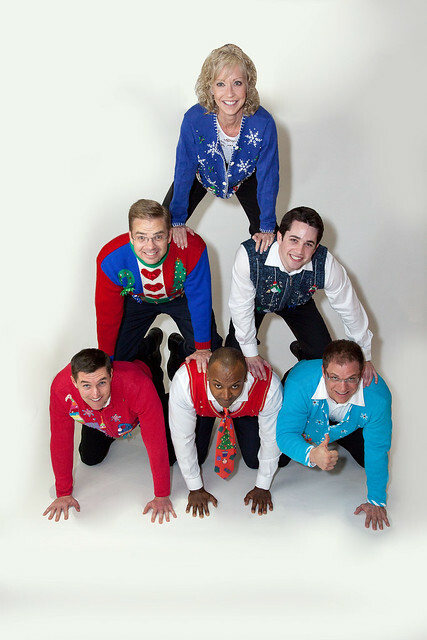 This leaves us with the sales, human resources, and “other” departments to calculate office space requirements. : Let’s assume that Sales needs privacy to conduct their calls, and all 64 sales people have their own small cube. 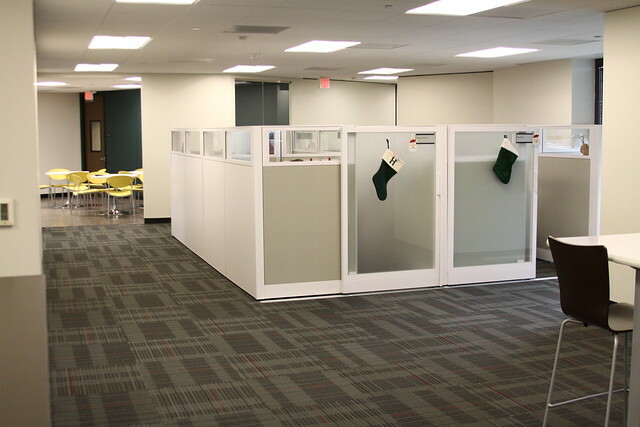 : Let’s assume that all 23 Human Resources professionals will occupy medium sized cubes. : All “other” employees – minus the 25 executives we accounted for in the executive office spaces – will on average occupy large cube spaces. This estimate accounts for the “other” employees who may occupy a larger space, and those who may occupy a smaller space. That’s about it for our workstation and office space assumptions. Next up on our office space calculation is conference and training rooms – a big priority for Square given epic Jack Dorsey speeches. 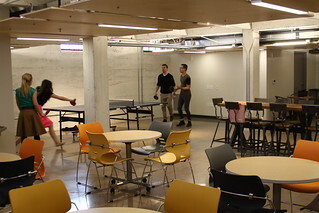 Judging by the photos, Square has multiple conference rooms and a very large event space. Let’s assume that three of the conference rooms are “large” (Seats 16-20 people), three of them are “medium” (seats 8-10 people) and six of the conference rooms are “small” (seats 4-6). As for the event space, it looks like the area seats 100 people. Using the Keyser iPhone app, we’d input (4) in the large training room space given that each “large training room” seats about 28 people. It seem as if Square headquarters has two receptionists that greet visitors. In looking at the diagrams within the Keyser app and comparing them to the Square pictures, we’ll allocate one large reception area and two small reception areas for visitors. Warning: we got a little carried away in this planning section. Let’s start with the easy assumptions: one large and one small copy room space for every 100 employees would equate to about 9 large and 9 small copy rooms throughout the headquarters. 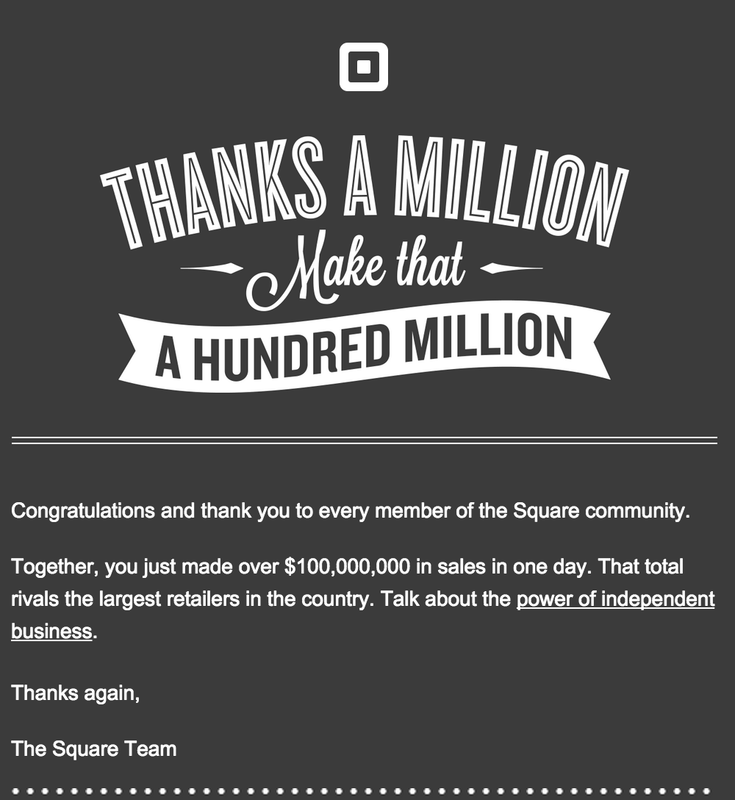 A couple weeks ago we received an email from Square saying that they processed $100,000,000 in one day. By dividing their annual amount processed in 2012 ($6B, according to this article) by 365 days, we find that Square processed an average of $16M+ per day in 2012. By dividing this average with the amount they recently processed in 2014 ($100M), we find that they’ve grown 6x since they hit 2M users in 2012. Assuming that the average amount a customer processes stays the same, let’s assume they’re at 12M users now. Let’s also assume they need one storage closet for every 10,000 customers (those Square payment processors are pretty small), and we come to the conclusion that Square needs about space to fit 1,200+ storage closets. 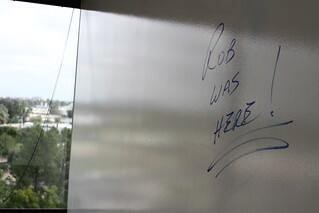 Told you we got a little carried away to calculate 10,950 square feet of office space. 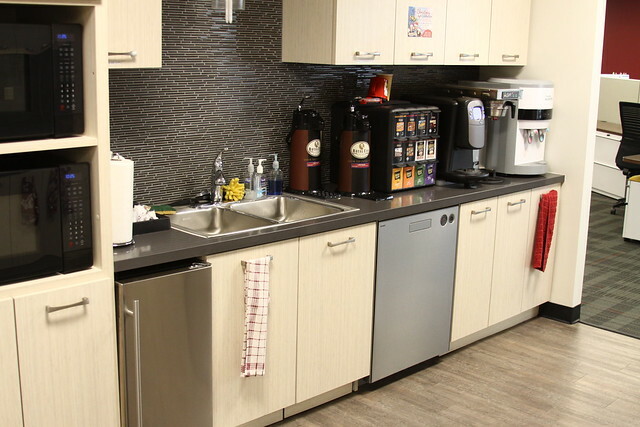 As we can see from the photos, Square has invested significant resources in their employee areas. 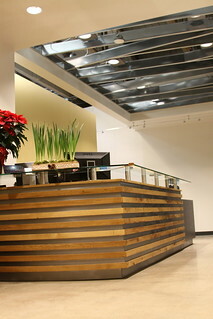 A coffee bar in the middle acts as a sort of “town square” with multiple large break room sized areas for employees to grab a bite to eat. Several wellness pods provide an escape down the large “avenues” of hallways. To account for this space in the Keyser office space calculator, we’ve estimated that the Square coffee bars are about 16 times the size of a regular coffee bar. 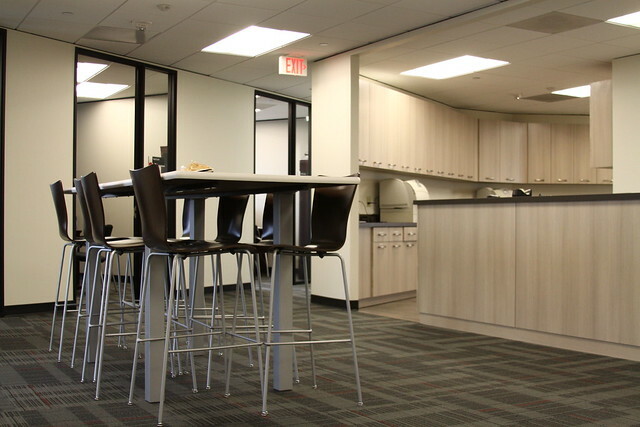 For break rooms, we’ll assume rough estimates of one “large break room” for every 100 employees (large break rooms seat 20) and a “standard break room” of one for every 40 employees (standard break rooms seat 8). 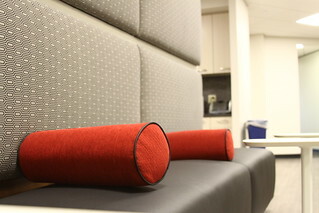 Since there are so many lounge areas throughout the office, these break rooms will cover this space. As for wellness rooms, it looks like there are about seven of these spaces included in the building. For the large library, we’ll estimate that we’ll need about 3,000 square feet. Let’s input these estimates into the app. Let’s allocate two large server rooms for the needs of Square employees. And, let’s assume Square operates in the cloud and has no need for a file room. 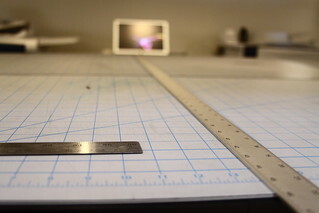 Based on our office space assumptions and estimates, it’s time to submit and calculate the Square office space needs in terms of square footage. The Keyser iPhone app will automatically calculate hallways circulation square footage, as well as load factor, usable space and the total amount of rentable square feet. This calculation is especially useful to help narrow down your office space search. Without further ado, here is our reversed engineered calculation of the Square headquarters: 174,806 Square Feet. 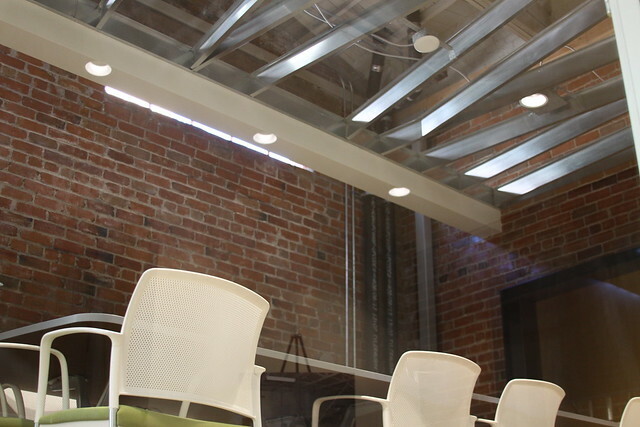 To help show entrepreneurs the effect an office space has on productivity, Keyser is shining the spotlight on organizations who place a high priority on their company culture. 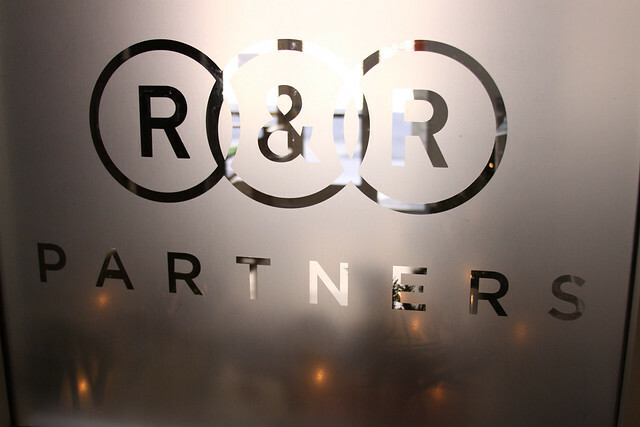 Today’s feature is on R&R Partners, a nationally recognized, integrated communications agency with eight offices around the country. R&R Partners has just renovated a historic warehouse on the corner of 2nd and Buchanan Streets. 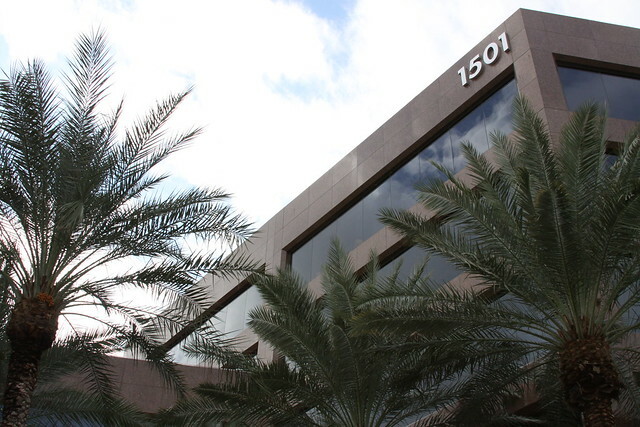 In November 2014, the 40-person Phoenix team moved into their new, permanent home. 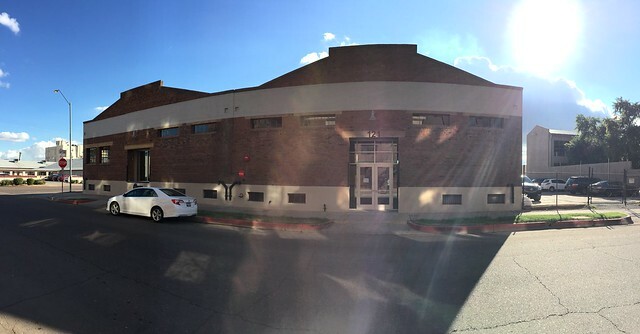 Listed on both the National Register of Historic Places and the City of Phoenix Historic Register, R&R was committed to preserving the character and integrity of the 1926 produce warehouse building. 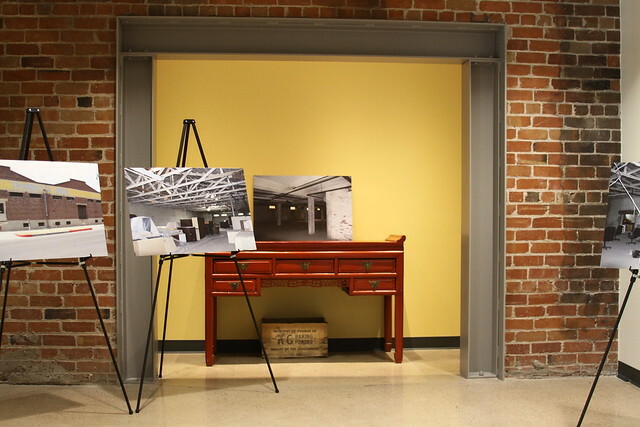 While R&R remains true to the building’s industrial roots, they also have given the space a makeover to match their personality. 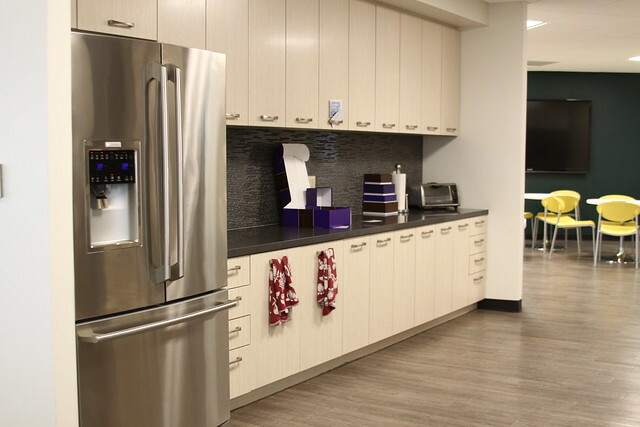 In this post, we’ll highlight some of the unique aspects of the R&R culture, as well as showcase their new office space. When you first enter the building, you’ll come across a tribute area that pays homage to the history of the 1920’s building. From the minute you step into R&R, you get a feel for the exposed style. R&R Partners knows that to get the best creative thinking from its employees, the company must nurture each person’s creativity. They understand that people are unique and that personal and professional passions define us as employees. 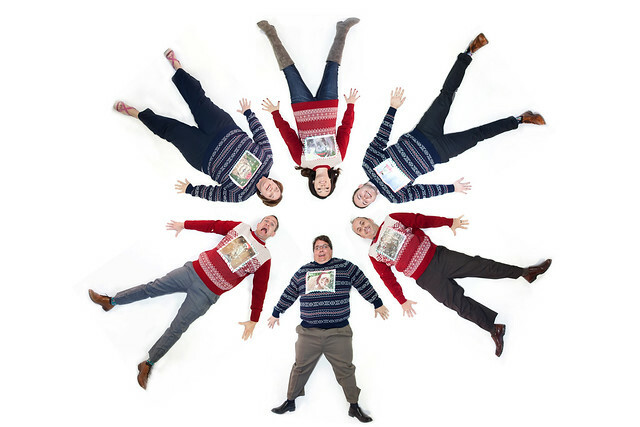 R&R’s creative culture inspires people to do great work. It’s an atmosphere that holds employees accountable, while fostering a collaborative, cross-functional approach to producing exceptional work. 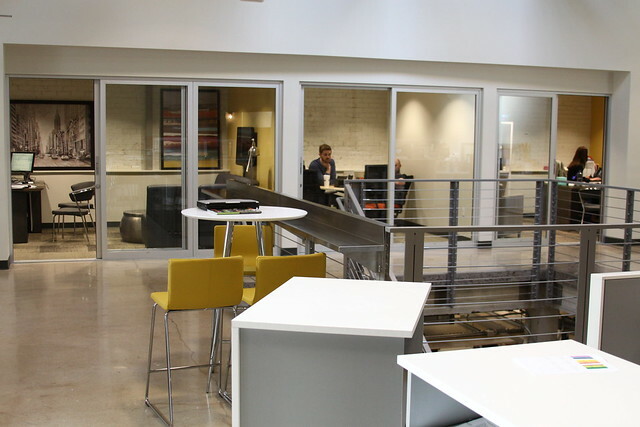 Led by Phoenix architecture firm CCBG Architects, the space was renovated to enhance collaboration and actively engage everyone in all levels of the business. 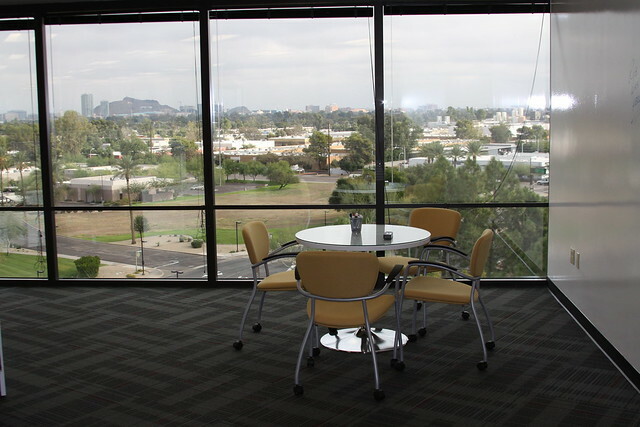 R&R Partners Executive Offices in Phoenix have an open feel with glass doors. 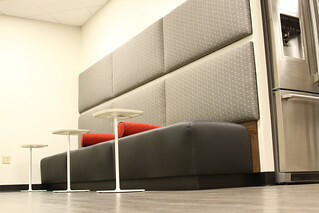 Sitting areas and layout of Director offices are tailored to their style of dialogue and collaboration. 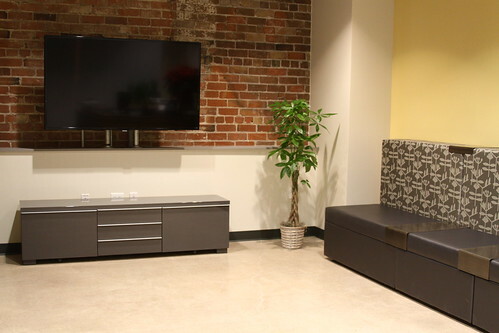 The open-concept, collaborative work space that has lounge areas for group discussions, little nooks for diving into partner projects and also a few private spaces for when you need some solo time. 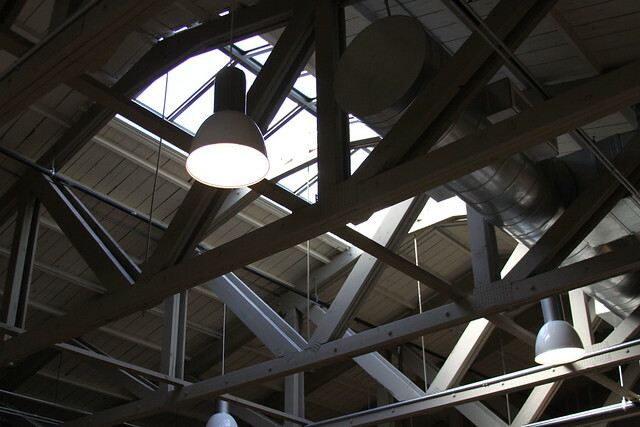 When R&R Partners purchased the building, the skylight windows were cracked. They were replaced and the whole skylight was upgraded and sealed. Now, the natural light shines down all the way to the basement. There’s a great authenticity and richness to the R&R structure. 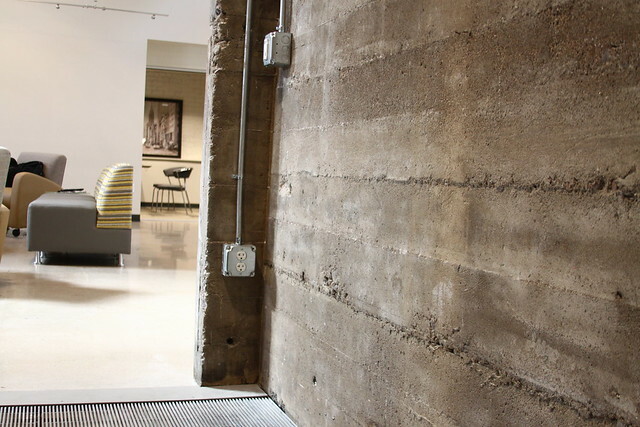 Concrete, natural wood and brick are rugged themes throughout the office. 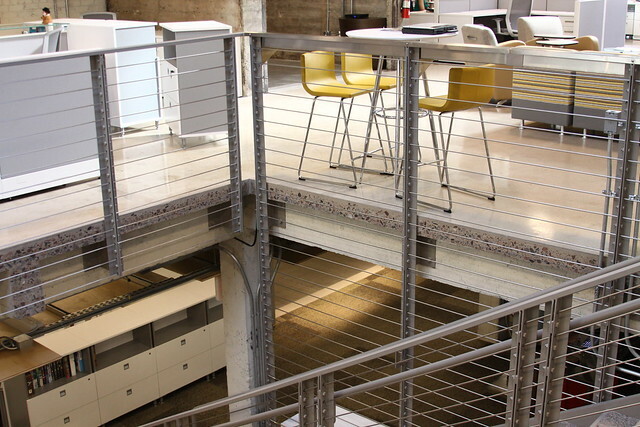 R&R Partners cut out two giant squares of concrete and built staircases to foster a collaborative space between the upstairs and downstairs areas. 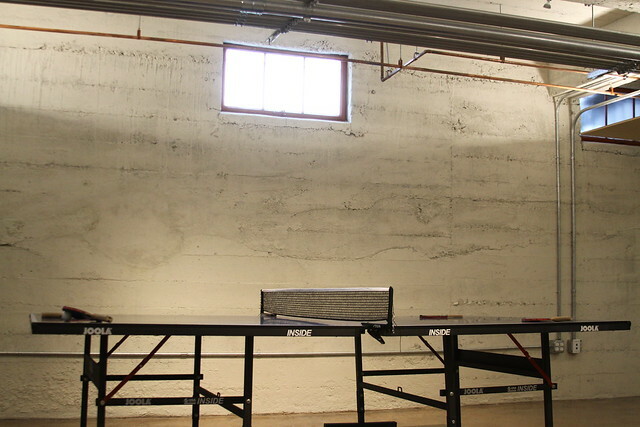 Perhaps this space feels right because the warehouse and the agency have so much in common. Both were built by entrepreneurial spirits. Both have deep roots cemented in the community. Both are authentic, vibrant and creative. It feels like home. 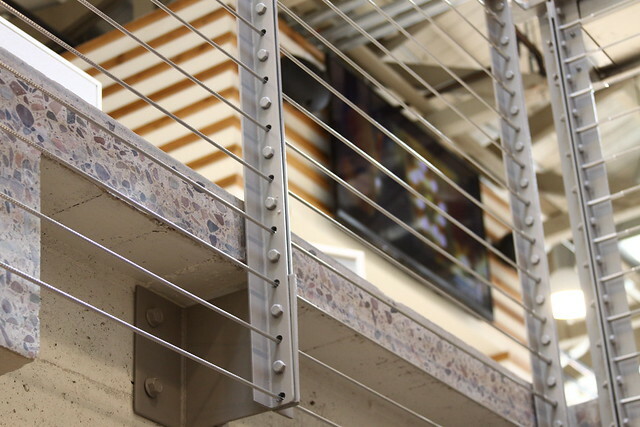 R&R Partners couldn’t help but add some personality to the 25,000 square feet of space. 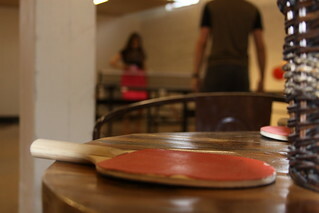 To fire up that competitive spirit and spark creativity, R&R features a ping-pong table and a Nintendo for employees to play. Because sometimes, the best ideas happen during out-of-work mode. The Phoenix office’s passion for ping-pong recently took off and inspired an all-office tournament where the best players from each of the eight offices around the country flew into Phoenix to crown one R&R ping-pong champ—Phoenix won. 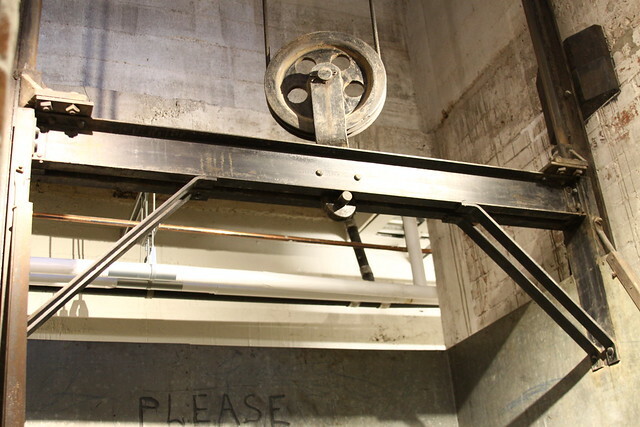 During the warehouse renovation, R&R Partners built around the existing freight elevator shafts. At the upper level, the elevator mechanism is visible in the R&R Partners suite next to the Lounge. 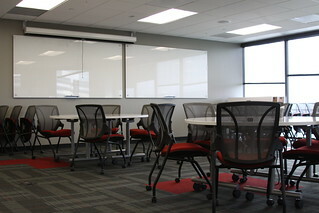 At the lower level, the cab is an out-of-the -way seating area for small group collaboration. 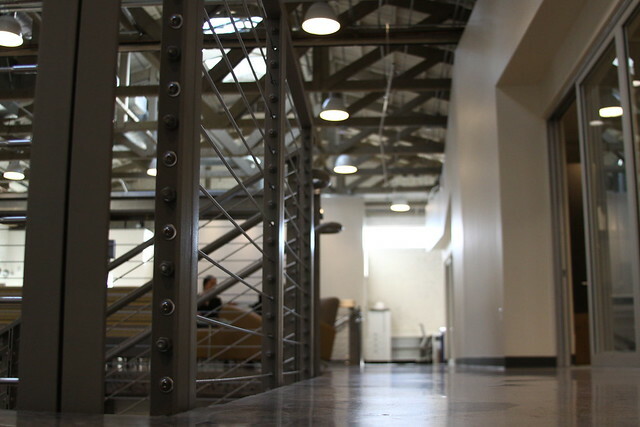 Several different types of flooring co-exist throughout the space. When R&R first moved into the space, they began to power wash the white off the brick. Some of the brick was so old that the power wash began to strip the brick. They decided to keep it white in some areas, while exposing the natural red brick in other areas. A place to escape the office within the office. No conference room is alike at R&R Partners, but the conference room adjacent to the reception area boast several historic elements. 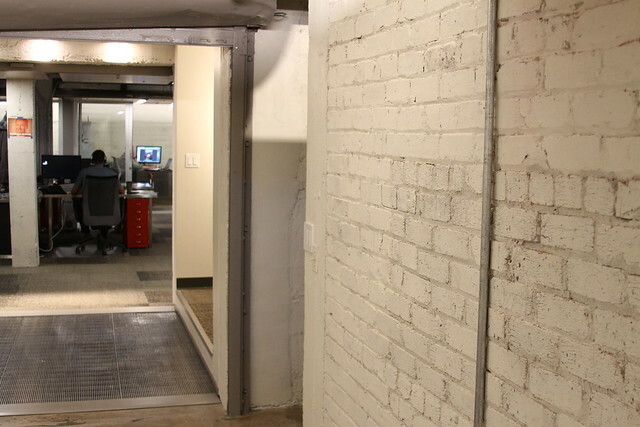 While collaboration is key, it is important to also realize that a completely open environment is not always the right solution, so they made sure to include some small private spaces as well – like the R&R War Room. 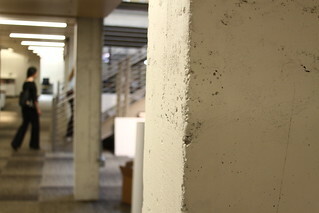 To learn more about the space and the renovation, please visit R&R’s dedicated microsite. 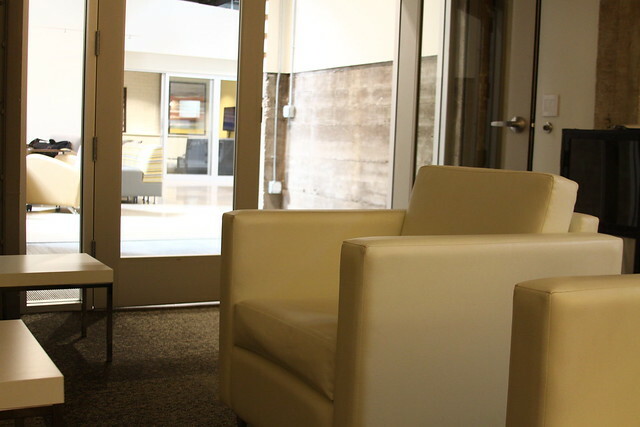 To help show entrepreneurs the effect an office space has on productivity, Keyser is shining the spotlight on organizations who place a high priority on their company culture. 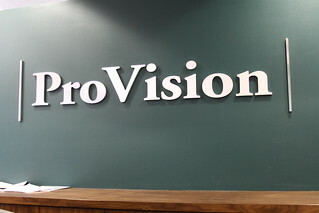 Today’s feature is on ProVision, a CPA firm for successful entrepreneurs, professionals and investors. 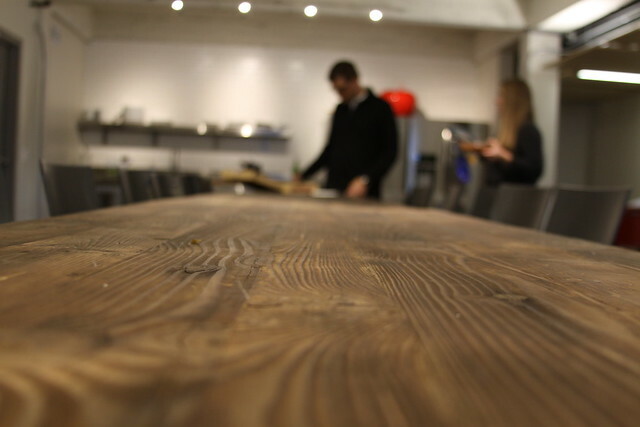 At ProVision, employees are more than just an employee. They are partners in providing the value and high level of service ProVision clients and employees have come to expect. In this post, we’ll highlight some of the unique aspects of the ProVision culture, as well as showcase their new office space. 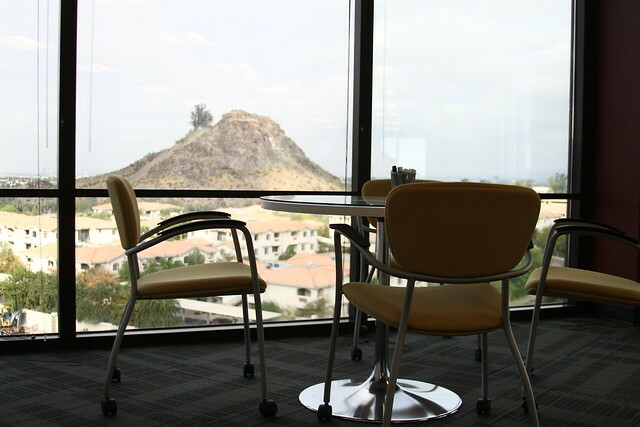 ProVision’s top floor presence offers stunning 360 views of the Valley. 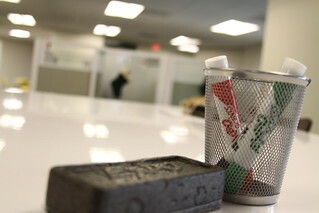 When Provision first saw the space, the previous tenant had seven foot tall cubicles pressed up against the windows. 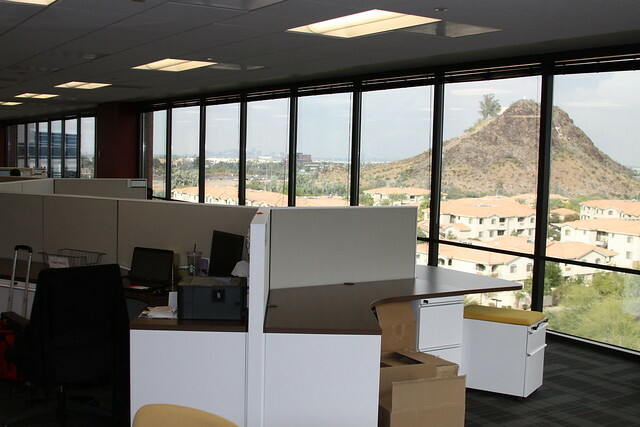 Provision cut the cube size in half, moved the workspace away from the windows, and created stunning 360 degree views of the Valley for the staff. A significant amount of space at Provision is dedicated to common areas. This approach ensures the team has opportunities to spend time together to strengthen the already strong Team Culture. ProVision fosters an environment that promotes responsibility and self-accountability, not micromanagement. 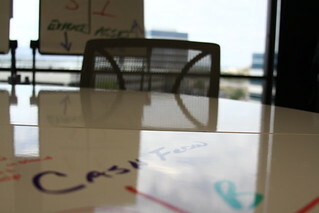 The Provision office has many whiteboard walls and tables to encourage collaboration, teamwork and creative thinking. ProVision understands work-life balance is the key formula for optimal employee performance. 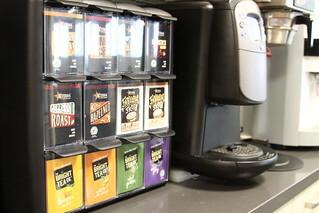 That’s why ProVision has included a state of the art kitchen with snacks and refreshments to enjoy. 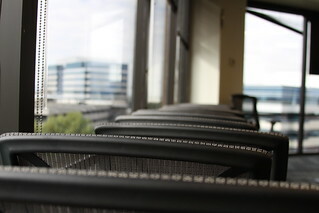 The ProVision office environment feels like home. 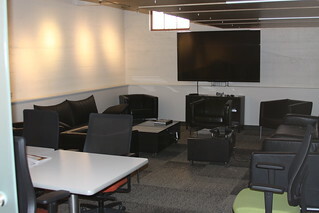 The Provision lounge area with a 80” television and plenty of snacks and refreshments allow an opportunity to relax with teammates. 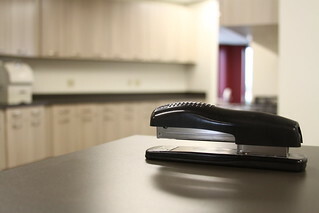 ProVision provides workstations with a bit more privacy for employees who spend significant time on the phone. 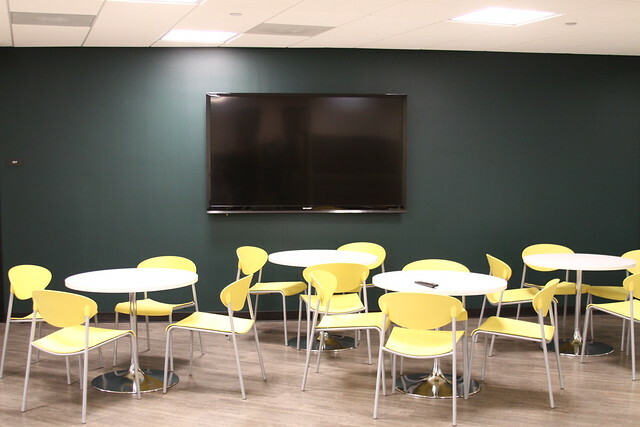 Provision’s office space features a large, state of the art training room with cutting edge technology to further Provision’s commitment to education on a variety of topics including keeping the team up to date on the ever changing tax law. 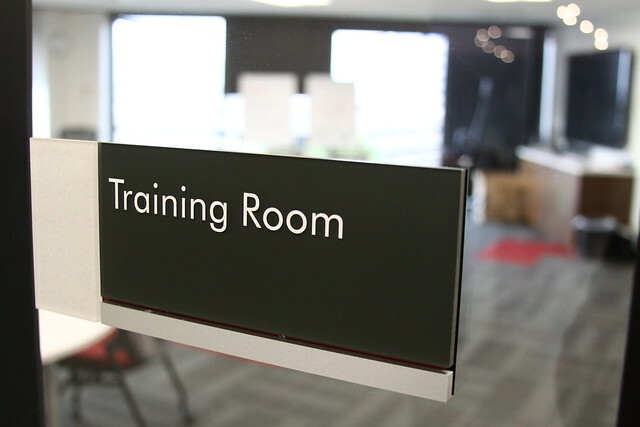 Each member of ProVision obtains 100 hours of training each year. 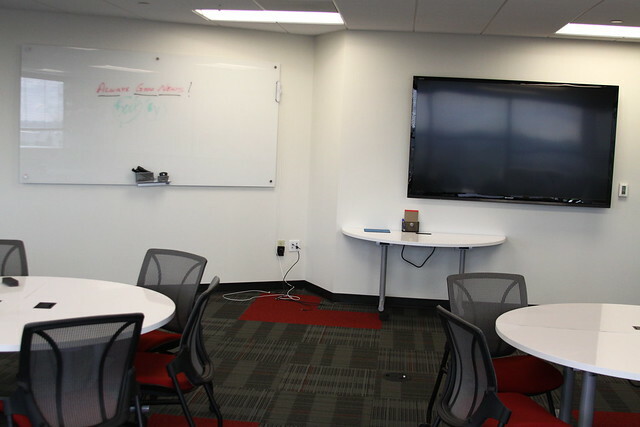 With employees across the country, Provision’s training room features a whiteboard that syncs up to a monitor and can be seen simultaneously by all employees. 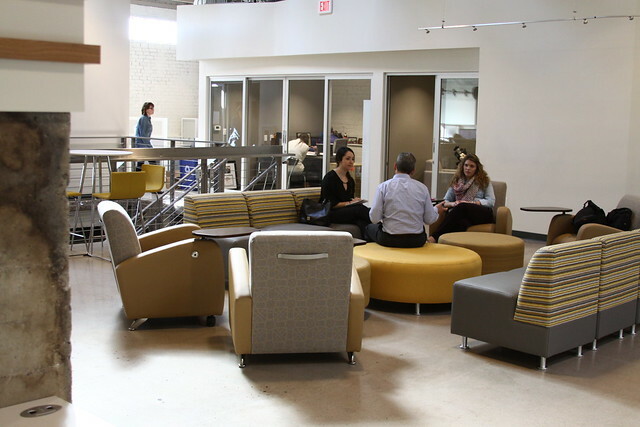 Provision’s collaborative, people-focused culture encourages mutual respect, open communications and ongoing learning.